It's been a while since I have posted anything so I figured I would spend a few minutes updating everyone on what I have been up to for the last month. The short answer: having a good time and enjoying my freedom. The long answer: Work, travel and play. For those of you who are completely unaware, there has been a few huge snowstorms across Canada over the past month. Vancouver, normally warm this time of year (look at the temp on the right side of my page) it was really cold through most of December. The good news is that we got lots of snow in December which made for some pretty heavy Christmas spirit. 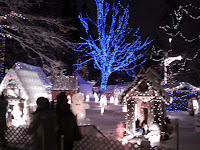 Every year, the Richmond firefighters and their community put on a display of xmas lights in Stanley Park. I had never been before but I went this year, just before Christmas. It was amazing with the snow. Above is a picture I took on my phone. Then, I flew back to Ottawa from the 20th to the 28th. This was fun times as well. Lots of snow (and cold weather around Ottawa) but I wasn't used to being in such cold weather so I froze most of the time. I did, however, get to see my niece and nephew, who were kind enough to pose for this photo. 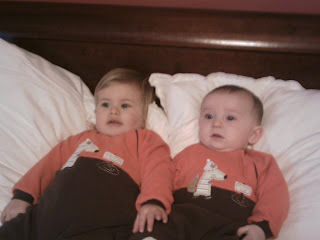 That's Ella on the left and Tate on the right. Guess which set of parents are American?? While at home, I was able to see some friends and spend some time relaxing in front of the TV. I also saw the Sens play the Dallas Stars. The Sens played terrible but still won. I wasn't too worried though because I knew I had another game coming up soon.... more about that in a bit. Also while I was home, I saw the family dog - Riggley. Unfortunately, we had to put him down shortly after I left but he was 16.5 years old and lived a fantastic life - which is the only reason I am not overly sad about his passing. Not many dogs have spent the winter in Europe (twice) nor have they had the chance to live that long so I think we were really lucky to have him. RIP Riggs. Here he is, doing what he loved best. I came back to Vancouver for a few days before heading down to San Francisco for New Years and my birthday. First things first: San Francisco is an amazing city. I had been before, in October 06, when my brother got married... so I have seen the city before. This time, I was with friends that live there, so I was able to get a more insider view of things. San Fran is great because I think it has everything. Great culture, great food, great people.... it is really a city that has everything. Anyways, I did celebrate my 33rd birthday down there and it was a great time. Many thanks to Paul and his family for the hospitality. I had a great vacation but now I am happy to be back at work. The way everything fell this year mean that I didn't have a full week at work for a while... and I would prefer to just work and get things done. Lots of amazing things happening at work too. We have a few products in the pipeline so lots of great marketing to get done. I start school again soon as well. I have three classes to finish and I will do them on weekends between February and start of May. Shouldn't be too bad. At least I will have my nights free and I am looking forward to learning some more things before I finish. Anyways, sorry it takes me so long to update... now that I have done a "data dump" I will post smaller things more often.